Arctic P in the Ross Sea of Antarctica under command of Capt Pugh. She set the record for furthest voyage south ever. The expedition became one for the record books, and Captain Russell Pugh and the crew of Arctic P demonstrated exceptional seamanship in setting a new world record for the furthest south–by any vessel–ever. A voyage of this magnitude requires significant preparation and professionalism, and EYOS was therefore proud to nominate Arctic P for the International Superyacht Society’s 2014 Distinguished Crew award. Below is the summary of the voyage that Expedition Leader Tim Soper submitted, and we were delighted when Capt Pugh accepted the award at the ISS Gala in Ft Lauderdale on October 29th. 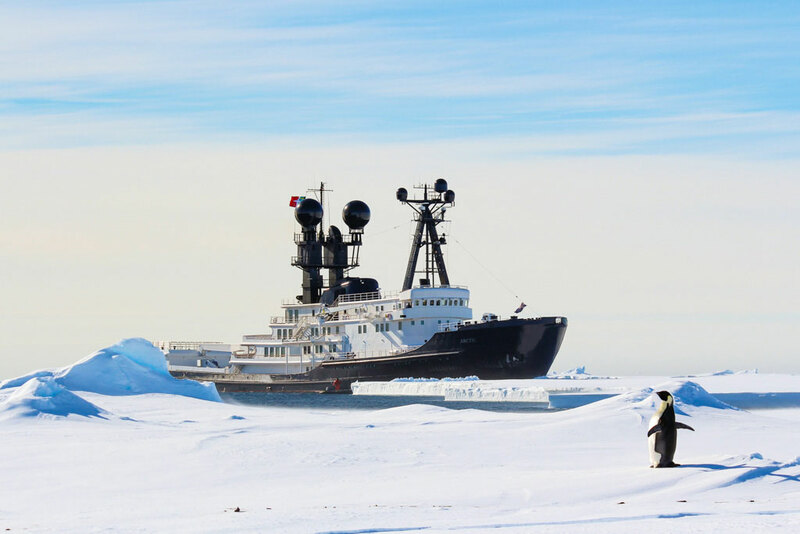 “In January this year Captain Russell Pugh commanded the expedition yacht MY Arctic P on a month long voyage to the Ross Sea region of Antarctica. “This involved a crossing of the infamous Southern Ocean of nearly 2,000nm and passing through the heavy pack ice surrounding Antarctica to reach the continent. “Those aboard were able to land at penguin colonies, explore research stations, cruise among gigantic icebergs, and visit the historic huts of explorers Scott & Shackleton below Mount Erebus, the world’s most southerly active volcano. “The voyage sailed along the Ross Ice Shelf to reach the Bay of Whales, the most southerly point of ocean on Earth. Here the vessel nosed into the ice to set a new record for the most southerly position of any vessel ever: 78°43.0336’S, 163°42.1317’W, as officially recorded in the Guinness Book of World Records. “Capt. Pugh maneuvered the vessel into a position where guests could disembark onto the frozen ocean for walks among Emperor Penguins and seals. The air temperature was minus 30°C with wind-chill and ice was forming on the sea surface around the yacht.